Materials are the foundation of essentially all clean energy technologies including advanced batteries, solar cells, low-energy semiconductors, catalysts for the capturing and storing CO2, and more. 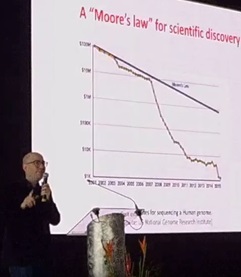 But discovering new materials is currently a time consuming and expensive process: to determine whether they will be useful, newly discovered molecules are run through simulation, synthesis, and characterization or testing in an expensive process that can take 10 to 20 years. Artificial intelligence (AI) and robotics combined with material sciences and other advanced methods could dramatically speed up development of new materials for all clean-energy technologies. The proposed integrated Materials Acceleration Platforms (MAPs) could cut the average time for developing a useful new material from 20 years down to one or two years. 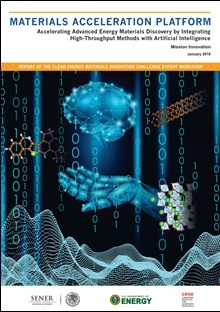 On January 25 in Mexico City, the Clean Energy Materials Innovation Challenge released a landmark report, entitled “Materials Acceleration Platform: Accelerating Advanced Energy Materials Discovery by Integrating High-Throughput Methods with Artificial Intelligence.” The Report is the result of a September 2017 workshop that convened more than 55 leading scientists from around the world to define the challenges, opportunities, and fundamental research needs related to materials discovery. The Expert Workshop Report calls for integrating material sciences with next-generation computing (high-throughput), artificial intelligence (machine learning) and robotics to accelerate the pace of materials discovery. Among the recommendations are development of ‘self-driving/autonomous laboratories’ that automatically design, perform and interpret experiments in the quest of new high-performance, low cost materials. “The performance, efficiency and affordability of clean energy technologies can be increased by finding materials with the properties you need. At the moment, we’re very much like Edison looking for filaments for his light bulb, testing them one by one in a sequential fashion, by trial-and-error, until we find the one that works. This report lays out a roadmap for methods that will let us quickly discover and design materials with exactly the properties we need. The key is to create fully integrated MAPs from beginning to end that enable humans to accelerate their pace of discovery,” said Alán Aspuru-Guzik from Harvard University, co-chair of the workshop and lead author of the report. 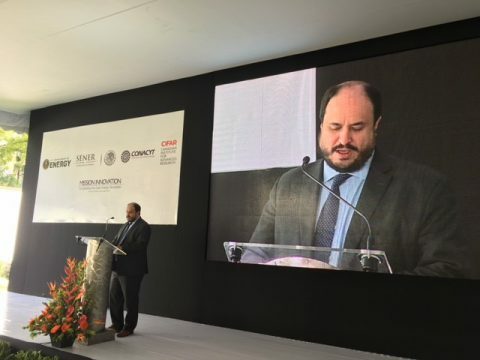 “We look forward to many more great things to come as we continue to work together to make our society cleaner, more efficient, and more sustainable,” said Pablo Valdez, Counselor for Environmental Affairs, Science, Technology and Health, U.S. Embassy in Mexico City. The workshop makes six recommendations that will lead to what it calls ‘materials acceleration platforms’ that would integrate automated robotic machinery with rapid synthesis and characterization of materials and artificial intelligence that would accelerate the pace of discovery. The platforms would help researchers transition from a largely trial-and-error method of materials discovery to one of ‘inverse design,’ in which materials with desired properties could be easily searched for and developed. 6) Sophisticated data infrastructure and interchange platforms. The report emphasized the need to develop multidisciplinary international teams of scientists and engineers with expertise in chemistry, materials sciences, advanced computing, robotics and AI, among other disciplines. “Private-sector stakeholders who join this initiative early will presumably have a first-mover advantage, that is, they will cultivate the know-how to adjust and gain a larger share of the growing benefits from these new technologies,” said Workshop Executive Chair and report co-author Hermann Tribukait, Mexico’s Energy Innovation Funds. 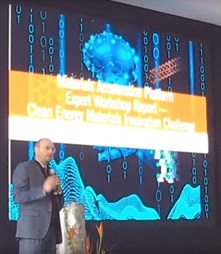 The Mexican Ministry of Energy (SENER) and U.S. Department of Energy (DOE), in partnership with the Canadian Institute for Advanced Research (CIFAR), sponsored the Clean Energy Materials Innovation Challenge workshop on Sept. 11-14 in Mexico City. A hundred and thirty people attended, including 55 leading scientists from top universities and research institutions, six keynote speakers and panelists—including Nobel Laureate Dr. Mario Molina, and Dr. Horst Simon, Deputy Director and Chief Research Officer at Lawrence Berkeley National Lab, 16 Mission Innovation member governments represented, and more than 50 students and observers from the private and public sectors. Attendees were from Australia, Belgium, Canada, Denmark, Finland, France, Germany, India, Italy, Korea, Mexico, the Netherlands, Norway, Saudi Arabia, Switzerland, UK, and the US. Professor Alán Aspuru-Guzik of Harvard University and Professor Kristin Persson of University of California-Berkeley co-chaired the workshop and co-authored the report. Professor Carlos Amador-Bedolla of Universidad Nacional Autónoma de México (UNAM) was the local chair and co-author, and Dr. Hermann Tribukait, Mexico’s Energy Innovation Funds, the Executive Chair and co-author. Mission Innovation (MI) is a global initiative of 22 countries and the European Union to dramatically accelerate global clean energy innovation. As part of the initiative, participating countries have committed to seek to double their governments’ clean energy research and development (R&D) investments over five years, while encouraging greater levels of private sector investment in transformative clean energy technologies. These additional resources and Innovation Challenges will dramatically accelerate the availability of the advanced technologies that will define a future global energy mix that is clean, affordable, and reliable. The Mexican Secretariat of Energy (SENER) conducts the country’s energy policy, within the valid legal framework, to guarantee: the competitive, sufficient, high-quality, economically viable and environmentally sustainable energy supply required by national life; a population with full access to the energy supplies at competitive prices, with world-class public and private companies, operating within an adequate legal and regulatory framework; a strong encouragement of efficient energy use, research and technological development, a broad promotion of alternative energy use, and security of the energy supply. The mission of the U.S. Energy Department is to ensure America’s security and prosperity by addressing its energy, environmental and nuclear challenges through transformative science and technology solutions. CIFAR is a network of almost 400 leading researchers from 17 countries. CIFAR’s 12 research programs bring together the world’s most outstanding minds to address the world’s most important questions. From clean energy to cyber security, systemic inequality, genetic disease, and beyond, CIFAR fellows break down the barriers between disciplines to create new knowledge for a better world.